Discover how the transducer within your sensor influences performance and reliability. Massa implements the same quality controls in place for the sonar systems manufactured for the U.S. Navy in all industrial and commercial products. 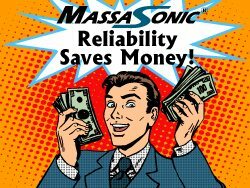 Some MassaSonic® products used in industry that were deployed in the 1980’s are still running in the field without replacement required. Massa has manufactured advanced sonar products used on the submarines that protect the American people for years with zero rejects.